Balanced - Made for contact hitters, this Z4000 has a Balanced weighting for increased swing speed and improved bat control. Dual Stamp ASA/USSSA - This bat is approved for USSSA, ASA, NSA, ISA and ISF softball associations. 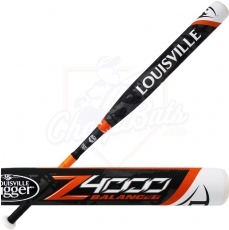 Get your Z4000 Slow-Pitch bat today, right here at CheapBats.com! No Hassle Returns, Batisfaction Guaranteed! Pros: Hot straight out of the wrapper, I'm not a home run hitter but my line drives were popping right off the bat. Feels great and swings great other members of the team are starting to use the bat. Pros: I purchased the BALANCED model of this bat in 26oz. weight - Does exactly what I expected: quick, light feel, good pop, great "base hit" bat. Cons: If you are a power hitter, I reccomend this bat in the END LOADED version, 28oz. Pros: This bat has great pop from the start. i can't wait to see what it does once I break it in more. The bat is easy to handle so you can pick your spots where you want to hit. My wife also uses it and gets good rips out of it. Pros: This bat has a great feel to it. It states balanced but my 26 weighs almost 27 ounces. The ruff finish on the barrel is nice as it doesn't leave ball marks and is suppose to create back spin on the ball. It hits really well. Pros: Solid pop, nice flex, nice grit finish. the grit finish keeps the bat from getting marks all over it. Pros: Tons of pop and hot out of the wrapper. Worried how this bat will hold up in the up coming cold weather. Pros: I really liked the weight distribution. Does not feel like a top heavy bat. Ive had a balanced bat before and it doesnt swing as good as this one. 7 of 45 found this review helpful. 6 of 47 found this review helpful. We are expecting more in 1-2 weeks. How does this bat hold up with a 40COR 400lb Compression ball? I wonder if it is build for a ball that hard. All ASA bats are made now for the .52 core 300 lb compression balls. Using a harder ball will have more wear and tear on your bat. The .40 core 400 lb compression ball is quite a bit harder than the standard ASA ball. The Z4000 ASA will work but does take the risk of breaking. I noticed that this bat has a 12 inch barrel length while other brands have 14 inch barrel. What is the pros and cons of the smaller barrel length? Most slowpitch softball bat barrels are between 12" and 13.5" long. It just comes down to personal preference as every person is different. Some people like a longer handle, shortened barrel that has all the power packed into a smaller sweet spot, while other people like a shorter handle, long barrel with an extended sweet spot. Are the "out of wrapper" bats new and do they come with a return receipt? If they do how long is the receipt good for? 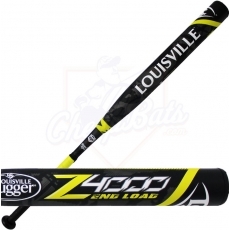 The 2016 Louisville Slugger Z4000 ASA USSSA Balanced Slowpitch Softball Bat SBZ416A-B that's out of wrapper is in a 34"/26oz size and was taken out of wrapper to take photos. This bat has NEVER been used for hitting and is brand new. However, please note, that any "out of wrapper" you purchase at a discount does NOT come with a warranty. If you were to purchase this bat you would get a receipt that would state that. I asked a similar question on a ASA Z3000 certified only bat. My league uses a 40 .COR and 375lb ball, however it was noted I should be using a USSSA bat for the harder ball, however my league adheres to ASA regulation bats. 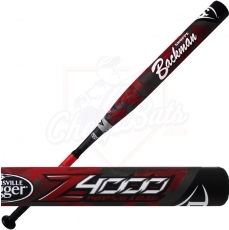 Would this bat be better suited for the 40 .COR 375lb ball than the ASA only Z3000? Thank you. Well, if your league adheres to ASA, you obviously need to go with an ASA bat. I don't see .40COR/375lb very often, that I can remember atleast, but it seems like a hard softball. The rule of thumb is, when using a hard softball, go with a bat that has a softer barrel surface (composite). When using a soft softball, go with a bat that has a harder barrel surface (aluminum). Since the ASA ball you're using is hard, then the Z3000 ASA only OR the Z4000 Dual Stamp ASA/USSSA should work just fine since they're both 100% composite. Also, the Z3000 & Z4000 bats come with a 1 year warranty, so if you're not happy with the performance of the bat you can always send it back for a refund or exchange it for another bat. Does this bat have the discs inside it? If so is one coming out without the discs? The Dual Stamp 2016 Louisville Slugger Z4000 ASA USSSA Slowpitch Bats do have restrictors due to them being ASA approved. However, the USSSA only Z4000 Slowpitch Bats don't have those same restrictors. They are available and in stock as well! You can check out the infographic image above as well that displays that exact information. What is the difference between the z4000 and z3000? The 2016 Z4000 and the 2014 Z3000 are very similar in their construction. The internal build quality of the Z4000 is going to be a little better and more refined due to added experience at the factory, and should translate into a more durable softball bat. The exterior of the Z4000 slow pitch bat also comes with a new "Grit Blast" finish, a gritty, sandpaper like finish that will add backspin to the softball and should help the softball to fly farther.